Do you want to capture the best photos of Sydney Opera house and the dazzling harbour? Then you’re in the right place. The walk across the Sydney Harbour Bridge (also formerly known as the coat hanger) is just amazing and if you are fit and capable there is no reason why you shouldn’t do it. It is an absolute must! You will get amazing Birdseye view photography that will make your photos look unique and special. The views from the bridge overlooking the water of the Sydney Opera House, the boats, ferries and the city’s Skyscrapers will just take your breath away. Just an idea…You could also do the walk closer to sunset and that way you will be able to see the daytime and nighttime views of the city. Wow, that would be incredible. Remember to take a jacket if you are planning to do this as it can get chilly on the bridge at night. This walk is suitable for all ages including families with strollers. It’s a really good pram walk however, the only downside is you will need to lift the stroller up the stairs to get onto the bridge as there is no lift access. If you have younger kids they are going to love the walk in the stroller whilst observing the cars passing on the other side of the bridge and the trains wizzing past. It can be quite noisy but they probably won’t even notice. I was a little anxious at first to take my two year old but she loved every minute of it. It’s definitely worth it for the experience and of course the breathtaking views. If you are worried about safety then don’t be. It is really safe even with kids. The bridge is constructed with heavy wire mesh along the sides of the bridge and has been designed in such a way to allow pedestrians to take photos through a gap that’s been left at the chest and head height. As you enter onto the bridge the first part along the walkway is not that exciting, however as you progress along the bridge and reach nearer to the arch of the bridge or the pylon the views are much more scenic and overlook the water of the Sydney Harbour. gap that’s been left at the chest and head height to allow pedestrians to take photos. The pedestrian walkway on the bridge allows visitors to walk safely across the bridge and it’s absolutely free. There are two ways to access the bridge: from the northern side of the bridge or from the southern side. 1. 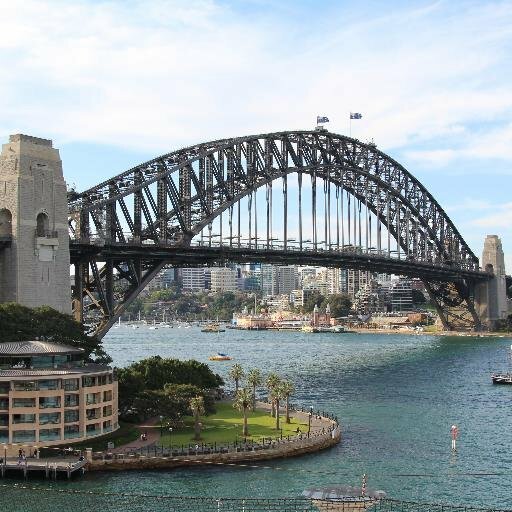 Southern side: You can access the bridge from The Rocks at Circular Quay and cross over the bridge to Milsons point. Follow signs for Cumberland Street and you will find the stairs to access the bridge from here. There are a lot of stairs up to the bridge from Circular Quay so if you are with a stroller or a pram then I would recommend taking a train from Wynyard to Milsons Point on the other side of the bridge. Alternatively you could catch the ferry from Circular Quay to Milsons Point ferry wharf. Although there are stairs on the northern side too, It’s a short flight of stairs up to the walkway which gives even greater views of the city as you head downhill towards Circular Quay. 2. Northern side: As mentioned above you can catch a train from Wynyard to Milsons point or take the ferry from Circular Quay to Milsons point ferry wharf (both are only 1 stop) and follow signs for the bridge walk from the railway station. There are lesser stairs to climb which is easier for parents with strollers. If you are alone I’m sure there will be someone close by who can help you lift the stroller. By walking across the bridge from the northern to southern, you will get the best views as you walk towards the city and not away from it. You choose if you want to walk one way or return. Either way public transport to or back is easily available and is 1 stop away weather you choose to go by train or ferry. Are the any toilets on or near the bridge? Yes the toilets are located in the first (southern) pylon. Once you come off the bridge there are also toilets at Milsons Point railway station. How long does it take to walk across Sydney Harbor Bridge? The Sydney Harbour Bridge self-walk is approximately 2.5 km in length. Without stopping, the walk will take about 1 hour. You might have heard of people talking about the Sydney Harbour Bridge climb. This is not to be confused with the Bridge walk. The Bridge climb is a paid tourist attraction that involves climbing the top arch of Sydney Harbour Bridge. This experience is not for the faint hearted or for those scared of heights. You will get to climb 134m above sea level, thus giving climbers an unforgettable view of Sydney’s city. Unfortunately you are not allowed to take a camera for safety reasons however, you will be given a professional photo of you at the summit which you have to pay for. If the Bridge Climb isn’t quite your thing you can always opt for the more affordable and accessible option and walk the Sydney Harbour Bridge for free. How much does the Sydney Harbour Bridge climb cost? There are several packages to choose from including a sampler package that takes you half way, Night package, twilight package and lots more. See the website for more details. Located in the South East Pylon of the Sydney Harbour Bridge, under the arch of the bridge is the entrance to the Sydney Harbour Bridge Pylon Exhibition and Lookout. For a small admission fee you can go up to the top of the pylon, 87 metres above sea level and experience great views of the Opera House, views of the city skyline and Sydney Harbour. Of course it is a lot cheaper to do this than the Bridge climb. The exhibition is in a room halfway up the pylon and the lookout is at the top of the total of 200 stairs. In the exhibition room you will learn about the history of the Harbour Bridge and how it was constructed. from 10.00am to 5.00pm (last entry 4:45pm). Note: Under-fives are not allowed to go up to the lookout. There is a bench seating area so one person can always wait outside with the kids while the other takes the stairs up the pylon to see the lookout. There is a bubbler here and toilets are inside the pylon. Are you wondering if you should do the pylon lookout or the climb? We are talking a huge difference in cost when it comes to choosing between the two. I personally would do the pylon lookout for only $15 and still get the same views and capture those views yourself. Don’t forget you cannot take your camera on the bridge climb. What would you choose to do between the two?